In Luke 17 the Lord healed ten lepers, but only one turned back to thank Him. What would we do if the Lord healed us from a terrible disease? It is hard to know. We spend most of our time being somewhat oblivious to what the Lord does for us. This is like the nine lepers who were healed of their leprosy but continued on their way. They appear to have taken what the Lord had done for them for granted. 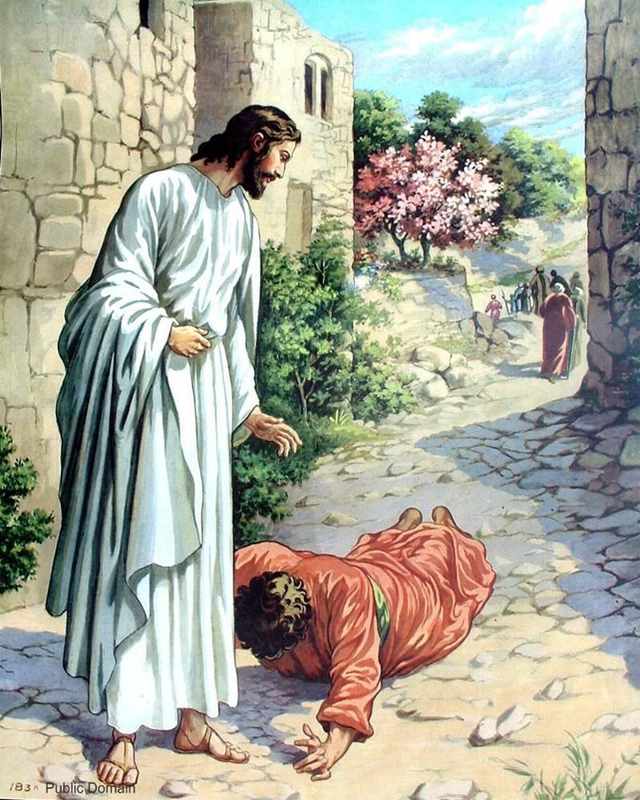 But one leper returned, falling down on his face at the Lord’s feet. This is a beautiful picture of the humility and gratitude that we should have when we stop and consider the extent of what the Lord does for us. It was the law that lepers who were healed must go to the priests to be examined (see Leviticus 14). Nine lepers did as the Lord told them. Imagine that you had a serious illness, and then the Lord healed you. What do you think you would do? How could you thank the Lord? Like the one leper who thanked the Lord, we can give glory to Him. This means acknowledging the Lord and worshiping Him by living according to His commandments (see Apocalypse Explained 678:3; 874). When we take the time to think about what the Lord does for us and then thank Him for these things, we are like the leper who took the time to thank the Lord. Feeling grateful does not arise from a conscious decision. Most likely the last time you felt grateful it was because you felt cared for. We all have times when we do not feel grateful to the Lord, and we need to recognize when this is our state of mind. We can't be aware of all that the Lord does for us. But He wants us to periodically recognize the extent of our need for Him, so that we welcome His help and healing. When we turn to the Lord in His Word, He can help cure our minds and cleanse our hearts. Dramatize the miracle of the Lord healing ten lepers. Use this project to retell the story of the Lord healing the leper, by pulling a strip of paper behind the cut out of a hand so it is leprous and then healed. Color the scene and the figures, then assemble to make a diorama of this miracle. Picture the leper smiling as he looks at his hands and sees that the leprosy is gone. The Lord has made him well! You may also want to show the leper coming before the Lord to thank him. When we are troubled by spiritual illness, the Lord assures us that He will help us if we call on Him. One way to approach the Lord and seek His help is to read the Word, looking for truths that can help us in our time of need. During His life on earth, the Lord healed many who came to Him or called out to Him. The Lord can heal our spiritual illnesses when we acknowledge His power to heal us and our need for His help. Remembering to thank Him for what He has done, helps open us up to further healing as we continue on our spiritual journey.